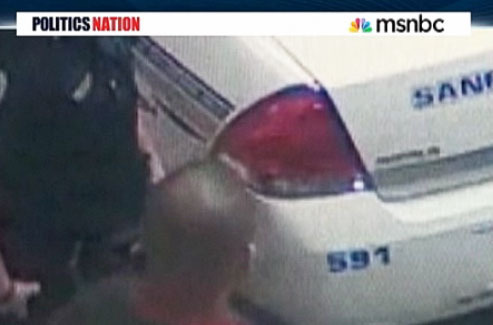 At [about the 11:45] point, without comment from Sharpton, new videotape of Zimmerman appears. It offers a very large close-up of the back of his head as he arrives at the Sanford police station on the night of the killing. This close-up isn’t grainy. And wow! In this close-up image, the back of Zimmerman’s head seems to be completely pristine. There isn’t the slightest sign of any blemish or injury. There isn’t a stub of a hair out of place. There is no sign of any injury….Does that close-up represent an accurate picture of Zimmerman’s head on the night of the killing? We have no idea. But this close-up photo is impossible to reconcile with two earlier close-up shots, including one close-up which was aired by MSNBC on March 29. That close-up seemed to show an obvious goose-egg on the back of Zimmerman’s head, crowned with an obvious abrasion. Later, ABC produced another close-up of Zimmerman’s head. This close-up was grainer, and more distant, than the image aired by MSNBC. But it seemed to show two abrasions on the back of Zimmerman’s head. Especially given NBC’s multiple problems with its editing of the Zimmerman 911 call, it really needs to be purer than Caesar’s wife on this stuff. Did anyone else notice the same thing on Sharpton’s show yesterday? How does the picture above compare to those you’ve seen elsewhere?